Voxengo Crunchessor version 2.8 is now available for download. 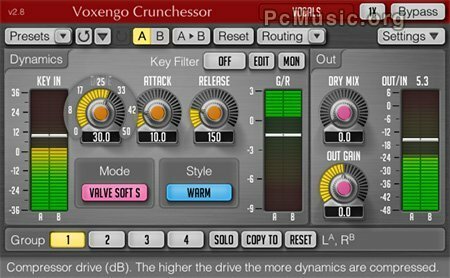 Voxengo Crunchessor is a general-purpose track compressor for professional audio production applications. It is available in AudioUnit and VST plug-in formats (including native 64-bit support), for Mac OS X (v10.5 and later), and Windows computers. Note that on Mac computers, Crunchessor now supports Mac OS X v10.5 and higher only, running on Intel processors. Mac PowerPC support is not available.